Cuil – “Worlds Largest Search Engine” – Our Tests Show New Web Search Engine Just Might Be Better Than Google – What Do You Think? Cuil is the child of a few ex-Google engineers who say they developed new technology that digs down deeper into the web to find what you are really looking for. After trying it for an hour, we have to admit that we are excited. The search results are not just different, they are more on point. It is like doing a “search within results” on Google, but again – different. We are also seeing results that we can’t find on Google no matter what terms we search under. 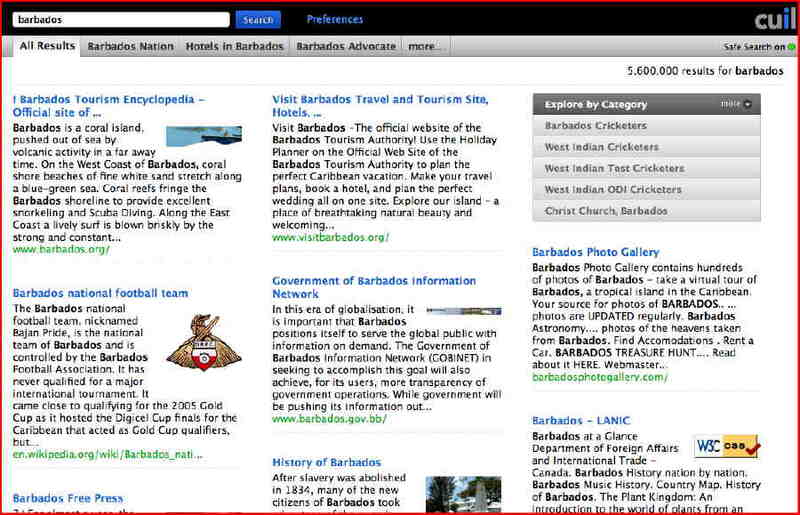 Search “Barbados” with Cuil – the world’s largest search engine – and you get back 5.6 million returns. Barbados Free Press is Number 3 ! In the meantime, try it out and we’ll talk about it. Who Made The Policy That Separated Mothers From 3-Year-Old Children At Kensington Oval? 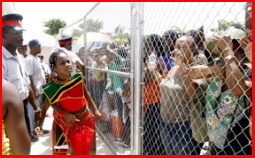 Dozens of mothers were in tears at Kiddies Kadooment when the police prevented mothers from accompanying their children into the Oval. The idea that parents and 3-year-old children would be separated from each other with no prior notice is absurd, dangerous and frankly, idiotic. We would like to have a first happen in Barbados. We would like the organisers of the event to announce publicly the name of the person or persons who made this decision. And speaking of “nobody fault”, what’s happening with all the criminal charges that were expected in the Hardwood scandal? Parents, who had earlier accompanied their children on the road as they jammed from Pelican Craft Village along Fontabelle, were barred entry from the Oval which was being used as the parade venue for the first time. As frustrated and panicking parents stood behind a fence they called out to their charges, some as young as three years-old who were on the inside without their guidance. One young mother wiped her eyes continuously, as tears flooded her face, after she tried in vain to get the attention of her four year old daughter on the other side of the fence. Barbados DLP Thank BLP For Advertising Prime Minister’s Cruise! Faulty Editor Allowed DLP To Advertise On The BLP Blog For Three Days! I would like to congratulate the BLP for allowing the DLP space on their website to advertise the upcoming cruise of The Hon. Mr David Thompson the Prime Minister onboard the HARBOUR MASTER this Sat the 2nd at 5.00pm. They must still be using the faltered program of the politics of inclusion to have allowed us the use of their site for the few days, whatever got into them I would very much like to thank them for promoting the event and realising that they are in opposition and are willing to be sensible in carrying out the affairs of this country. Once again thank you all at the BLP for giving exposure and supporting the upcoming charity event being hosted by the DEMOCRATIC LABOUR PARTY. We in the DEMOCRATIC LABOUR PARTY thank you for allowing the opportunity to promote our cruise on your website, we loved it.